Imagine you are starting a new job in Utah County and meeting your new boss for the first time. Confidence is key to your success. As you reach out to shake the extended hand your broad confident smile exposes rows of pearly white teeth, yet when you open your mouth to exchange greetings you worry about bad breath. Perhaps your breath is not as a pleasant as you had hoped. Bad breath is a worry and possible embarrassment for many residents of Utah County, from ages 20 to 80. Regular dental checkups with cosmetic and general dentistry practice Hammond Aesthetic & General Dentistry can help alleviate your concern over bad breath. We have been addressing bad breath since 1996. The technical term for bad breath is halitosis. Many factors can cause or contribute to halitosis. One of these factors is the food you eat. Onions and garlic are both known for having a potent affect on your breath. Simply observing the foods you eat here in Utah County can result in a change in your breath. In most cases, bad breath originates in your mouth. Transient bad breath can be resolved through eating or brushing, and is a temporary condition usually associated with a dry mouth. Persistent bad breath can be a serious problem effecting as much as 25 percent of our Utah County residents. Persistent bad breath can be caused by dry mouth, and is made worse when food is not cleared away properly. Brushing and flossing daily is a critical step in curing bad breath. Food particles can build up in your mouth and foster bacteria which can cause bad breath. This not only includes the food particles that may get stuck between your teeth, but also the food that collects around your gums or on your tongue. Brushing and flossing daily can help reduce the amount of food particles that stay in your mouth and cause bad breath. Regular visits to Hammond Aesthetic & General Dentistry in Provo can also reduce or eliminate the progression of bad breath. Other factors that can contribute to bad breath for Utah County residents include dry mouth, tobacco use, and health concerns such as infections. 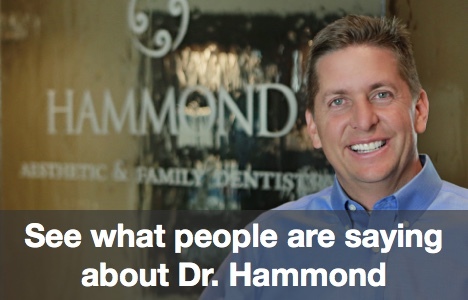 Come visit Hammond Aesthetic & General Dentistry located in Utah County; we’ll provide you with information about bad breath treatment in a professional environment. Give us a call at 801-374-0070 to set up an appointment. We also offer cosmetic dentistry services in Utah County.